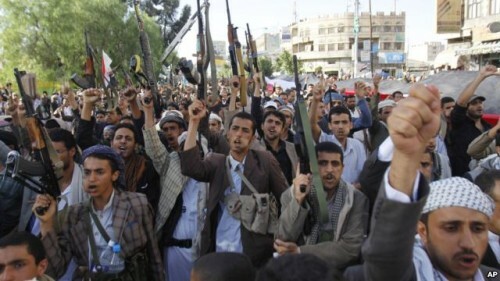 The political and military situation in Yemen moves from bad to worse. More than 750 people have been killed in the past three weeks, amid Saudi-led airstrikes against the forces of Ansar Allah — the “Houthi” movement in control of the capital Sanaa — which have been advancing through the south towards the port of Aden. The UN says about 150,000 people had been driven from their homes. The newly-formed Council of Sunni Scholars, made up of armed tribes and clerics, have taken much of the eastern oil-producing province of Hadramawt. Al Qa’eda in the Arabian Peninsula seized a large weapons depot in the capital of Hadramawt on Friday, claiming dozens of tanks, Katyusha rocket launchers, and small arms. A day earlier, AQAP took over a major airport, an oil terminal, and the area’s main military base. For three years, Yemen has been touted as a successful model of international intervention to contain the crisis triggered by the Arab Spring—at least according to the United Nations, various UN Security Council ambassadors, and, most importantly, the UN special adviser on Yemen, Jamal Benomar, who today announced his resignation after four years in the job. But the deteriorating situation of the country, particularly after President Abdrabuh Mansour Hadi was ousted by the Zaidi Shia Islamist rebels known as the Houthis in mid-January 2015, has put an end to this rhetoric. And since March 25, when a Saudi-led coalition of Arab and other states launched a military intervention, the situation has worsened considerably. When Jamal Benomar assumed his position as special envoy in April 2011, Yemen’s then-president, Ali Abdullah Saleh, knew that he could not hold out for long against the many opposition currents that had converged to overthrow him. This simplified the task of the UN envoy, who—along with Saudi Arabia and other Gulf states—brokered the implementation of the so-called Gulf Initiative, according to which Saleh would resign and hand power to Hadi, his vice president, in a managed transition. After months of negotiations and despite the intensification of violence, Hadi was finally able to accede to the presidency in February 2012 with considerable international and Yemeni support as part of a transitional process that was not to exceed two years. The Moroccan-born Benomar’s ability to speak Arabic allowed him to address Yemeni politicians directly, avoiding the linguistic obstacles that foreign ambassadors often face in Yemen. His linguistic abilities also helped him win struggles for influence with other diplomats, such as the U.S. Ambassador, in Yemen. The fact that Yemen was less complex than countries such as Syria or Libya, with a local conflict that could still be contained and had only limited foreign involvement, also strengthened the hand of the UN envoy, who had a number of opportunities to propel a full transition process in Yemen. However, Benomar’s dominant position also meant that much hinged on his performance. It was difficult for one person to effectively manage all the parallel tracks of peacemaking in and around Yemen. Benomar’s continuous replacement of his small staff of aides did nothing to help the situation; in three years, his team was changed at least three times. The result was an increasing lack of coordination between Benomar’s office and the offices of other diplomatic missions in Yemen and even with other United Nations bodies. Benomar’s monopoly of power thus led to the absence of an integrated international policy, and when the UN envoy did not lead, the process quickly stagnated. For example, one of the main reasons that the September 2014 Peace and National Partnership Agreement between the Houthis and Hadi’s government collapsed earlier this year was because the UN envoy’s office focused almost exclusively on implementing one of its components: the creation of a joint committee outlined in Article 16 that was to continue negotiations. The office did not consult with local and international signatories or supervisors, allowing Benomar to maintain control over the process. But because he was abroad most of the winter, there was little progress during the crucial months following the agreement. Many Yemeni leaders also complained that they did not know the content of the agreement until it was presented for signing. For days, Benomar had negotiated the agreement with the Houthi rebel leader Abdul-Malik al-Houthi without anyone else knowing its details. The turn to war and international intervention in Yemen is a consequence of the failures of the Yemeni model. By sponsoring negotiations between the Houthis and other political parties after the Houthis placed Hadi under house arrest and declared their own constitution this January, Benomar recognized the reality imposed by the Houthis and sounded the death knell of the transition process. Of course the situation in Yemen is not only due to the UN envoy’s efforts, or lack thereof. Many overlapping local, regional, and international issues have contributed to the collapse of the political process, including the Saudi-Iranian conflict and the regional struggle to support or oppose the Muslim Brotherhood. Ultimately, the failure is also linked to the original 2011 Gulf Initiative and its concept of a gradual compromise solution to Yemen’s crisis. The Gulf Initiative granted Saleh and his associates immunity from any legal prosecution, and it shied away from addressing human rights abuses committed during the uprising of 2011. It also did not stipulate that Saleh must abandon politics in return. Even though Saleh reluctantly surrendered the presidency in 2012, the former Yemeni leader remains highly active, having facilitated the Houthi expansion into Sanaa in 2014 to help orchestrate the overthrow of Hadi in 2015. The Yemeni model also failed to take into account that dealing with a state like Yemen, which is economically weak and exposed to severe security threats, requires improving state institutions and supporting the country’s economy in order to produce a palpable difference for its citizens. Instead, frustrated Yemenis continued to fall prey to political polarization and the recruitment efforts of armed groups like the Houthis or al-Qaeda in the Arabian Peninsula (AQAP). Considering the delicate political process the country was going through, the road map should have been more realistic than the one laid out by the Gulf Initiative. Its obsession with time had adverse effects as it prescribed the holding of a National Dialogue Conference in January 2014 without any real preparation. This led, tragically, to a discussion about the shape of the political system even before immediate grievances were addressed. In particular, the time schedule envisioned by the Gulf Initiative led to a speeding through of the draft constitution, the division of provinces in just two weeks, and an attempt to impose the constitution before putting it to referendum. All of this created a state of local public anger, which the Houthis used to their advantage when they overtook Sanaa in September 2014.